Rangers are the men and women fighting on the front line to preserve and protect wildlife. Rangers may also be called game guards, field enforcement officers, or other titles. Rangers help endangered elephants and other wildlife by; patrolling and fighting poachers, removing snares, observing herd movements, monitoring environmental changes that may affect wildlife, securing national park borders, tracking animals in need of veterinary attention, and much more. Most rangers endure difficult conditions. They can be stationed miles away from their families for long periods, live in makeshift housing, lack proper tools or training, and receive little pay. Many have lost their lives fighting poachers. To do their jobs effectively, rangers must be given adequate training, field conditions, equipment, pay, benefit packages, and staff support. Unfortunately, government resources often fall short and the rangers’ needs are not met. This is where Elemotion Foundation steps in. In Sri Lanka, we work with the Department of Wildlife Conservation to discover ways we can improve the rangers’ living and working conditions. 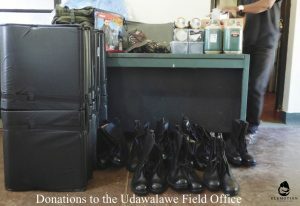 Examples of our work include: donating equipment such as head lamps and jungle knives; donating useful items for field quarters such as beds, sturdy boots, and raincoats; supporting rangers’ community awareness programs; traveling to remote field offices to understand their needs in person; and providing special training sessions. – Special project support. Sometimes the rangers are have great conservation initiatives, but funding is not available. If we agree the initiative will be beneficial and have permission from the Department of Wildlife Conservation, Elemotion Foundation will fund and follow the rangers’ projects. Cost varies per project. See our completed work below. An invasive species is a type of plant or animal that is not native to an ecosystem and causes harm. Lantana camara is a particularly problematic invasive species throughout the world, especially in our own Udawalawe National Park. This flowering bush has spread through vast areas of the park, crowding out other plants and limiting food for elephants and other animals. In fact, the elephants in the Udawalawe National Park have noticeably poorer body conditions when compared to elephants in parks without a Lantana problem. The rangers of the Mau Ara beat office are combating Lantana and improving their park’s ecosystem. In 2017, the rangers began clearing some trial plots to understand the best extraction methods and the short-term effects of removing the Lantana. The trials were a success! 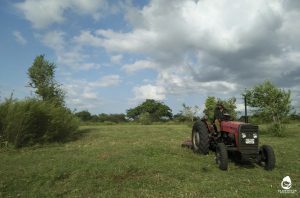 In 2018, with the permission of the Department of Wildlife Conservation, Elemotion Foundation is supporting the Mau Ara rangers in clearing approximately 80 hectares of parkland. The clearing, first done by machine and then by hand, must be done repeatedly throughout the year. 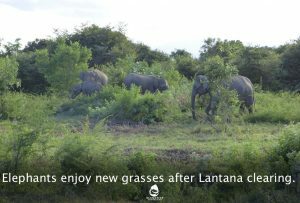 Already, new grasses, elephants, deer, and birds are visiting the Lantana free zone. The clearing has also has another unexpected and positive impact for you too! Without the tall Lantana thickets, park visitors can better observe the wildlife from a respectable distance. We applaud the Mau Ara rangers’ initiative and dedication to this very hot, strenuous work. We thank the Department of Wildlife Conservation for allowing us to support the rangers and be a part of this incredible project. We hope the DWC will help us maintain and expand the clearing project to other areas of the park too! October 2017. Proper clothing and equipment is essential for rangers to do their jobs well. And, during rainy season, rain coats are a must! Just before the start of the wet season, Elemotion Foundation learned the rangers at Kaudulla National Park could use some new raincoats. We were able to source them fairly quickly and deliver 31 coats in October. We’re happy the rangers will stay nice and dry! Kaudulla National Park is located in the Polonnaruwa district, in north-central Sri Lanka. During the dry season, from July to October, hundreds of wild elephants migrate through Minneriya and Kaudulla National Parks to drink in the watering holes. This event is called ‘The Gathering’. September 2017. Elemotion Foundation continued our herpetology trainings for new rangers. 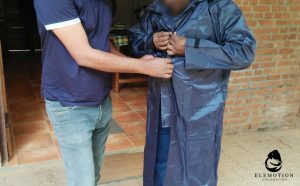 This time, we were joined by 20 new Udawalawe National Park rangers and members of the veterinary staff from neighboring Lunugamvehera National Park. Herpetologist Sameera Karunarathne, was our guest speaker. 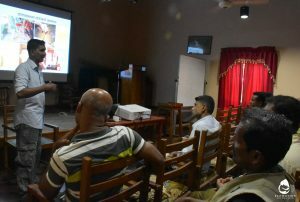 The one day training session focused on Sri Lanka’s reptiles and guidelines on how to deal with these beautiful, but sometimes dangerous animals. Udawalawe and Lunugamvehera National Parks are home to hundreds of wild elephants. Elemotion Foundation is delighted to continue our work with these dedicated rangers and veterinarians. July 2017. 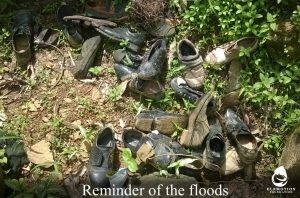 The devastating floods on May 18th and 19th resulted in over 200 human deaths, thousands of damaged properties, and hundreds of thousands of displaced people. The field office at the Sinharaja Forest Reserve was also destroyed. The Sinharaja Rain Forest is a lowland rain forest located in southern Sri Lanka and an Unesco Heritage site. The unique biodiversity includes endemic species only found in the rain forest. In addition to the amazing biodiversity, Sinharaja is home to two very special wild elephants. The field office at Sinharaja had dire welfare needs. Luckily, a local home was sourced to become the new office, but the rangers were still lacking supplies and equipment. After deciding on their most important needs, we were able to fulfill the requests which included: a rice cooker, an eco-friendly induction cooker for meals, head lamps for night patrols, raincoats, boots, and more. May 2017. 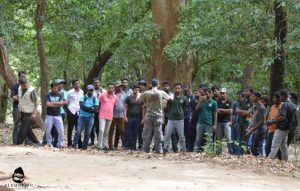 Elemotion Foundation sponsored the training session, ‘Reptiles of Sri Lanka and their Conservation’ for 30+ rangers (also called game guards) of Kaudulla and Minneriya National Park. After the first training sessions at Udawalawe National Park, this is our second collaboration with Herpetologist, Sameera Karunarathne. The training included two parts, theoretical and practical. 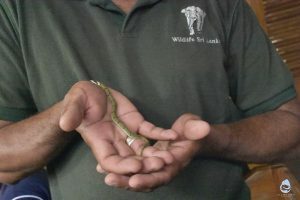 The reptile training session helps the rangers better do their work by: allowing them to identify specific species, handle the animal if needed, understand the reptile’s role in the parks’ biodiversity and its impact on conservation within the parks. Both parks combined are home to hundreds of wild elephants. In August-September, additional elephants migrate to Minneryia to access watering holes. Better trained rangers will help all of the parks’ wildlife. February 2017. Elemotion Foundation was delighted to support this field office located in Udawalawe National Park. Many of our projects are in or around Udawalawe National Park, so it was a pleasure to assist these men. The hard working rangers were in need of items for their living quarters and equipment for the patrolling team. Items donated included; mattresses, rain suits, jungle boots, mosquito nets, 10 head lamps, water tanks, carry bags, and more. Since Elemotion Foundation is often in Udawalawe, the rangers and our team discussed the special challenges facing wildlife in the park. We look forward to working again with this field office to support their conservation initiatives. October 2016- spring 2017. Elemotion Foundation conducted a nationwide ranger survey in Sri Lanka on behalf of the World Wildlife Fund for Nature (WWF). 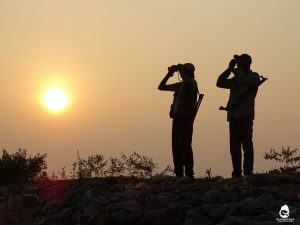 The survey is an effort by the WWF to identify ranger needs and help governments in Asia ensure their wildlife protection forces are as effective as possible. Our team travelled long distances to meet with the rangers in their remote beat offices or field locations. The rangers are always very busy and often spread out in the field, so the survey times were arranged in advance. Over 140 questionnaires and interviews were conducted anonymously. The data was collected and is currently being prepared for submission. We are happy to be a part of this very important project and look forward to teaming up with WWF again. May 2015. Elemotion Foundation sponsored educational training sessions for new game guards 35 new game guards and 15 other staff at the Udawalawe National Park. The two day-long sessions focused on Sri Lankan reptiles and vegetation found in the park. Guest herpetologist, Sameera Karunarathne, and botanist, Nalinda Peiris conducted classroom and practical studies in the field. Udawalawe is home to hundreds of wild elephants and the official release ground for the wild orphans of the Elephant Transit Home. Sponsoring these kinds of sessions educates and inspires the rangers working to protect Udawalawe National Park.